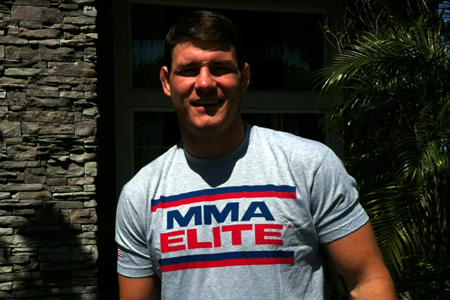 UFC middleweight Michael Bisping (pictured) married his longtime girlfriend, Rebecca, this past weekend at Rancho Las Lomas in Orange County, California. Since Bisping is accustomed to having UFC announcer Bruce Buffer introduce him after his walk to the octagon for the past eight years of his professional fighting career, it was only fitting for “The Count” to call upon Buffer to announce he and his bride after they walked down the aisle together. Sorry, fight fans. There was no Buffer 360. According to reports, Michael and Rebecca have three young children together.